In the midst of the recent partial shutdown of the federal government, controversy arose concerning when, or where, or whether, President Donald Trump might deliver the annual State of the Union address. The president was originally scheduled to give the SOTU speech on January 29, but the government was in shutdown mode. Speaker of the House Nancy Pelosi (D-CA) quibbled about the event’s expense and claimed that “security concerns” necessitated a postponement. (The timing of the speech is traditionally set by invitation of the Speaker.) Not since the space shuttle Challenger disaster in 1986, during President Ronald Reagan’s second term, had a SOTU been postponed. Determined to go ahead, President Trump briefly considered alternate locations. The symbolic spat was resolved when the shutdown ended. The speech will be Tuesday night, February 5, in the usual venue: the Capitol’s House of Representatives chamber, before a joint session of the House and Senate. The U.S. Constitution (Article II, Section 3) requires that the president “from time to time give to the Congress Information of the State of the Union.” Beginning with George Washington, U.S. presidents delivered to Congress an Annual Message, using it to lay out their agenda for the coming year or highlight accomplishments of the previous one. Washington spoke to Congress in person, as did John Adams. But the nation’s third president broke with that precedent. Known more for his writing than his oratory, Thomas Jefferson sent an official letter. 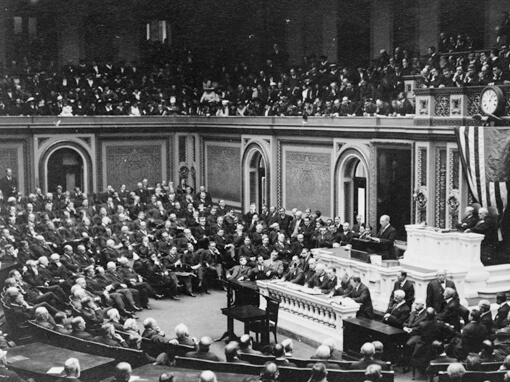 The custom of the direct speech was revived more than a century later by Woodrow Wilson, in 1913. In all, there have been 95 in-person Annual Message/SOTU addresses. The State of the Union address has undergone other changes as well. It has been broadcast on radio since 1923, televised since 1947, and webcast live since 2002. Beginning in 1966, a spokesperson for the opposition party has been given airtime for a response or rebuttal. The SOTU address is now one of the most important events on the nation’s political calendar—attended not only by members of Congress, but by the nation’s top military brass, its diplomatic corps, some Supreme Court justices, and specially invited guests. But SOTU has its critics. Some ask, why in a republic founded to throw off a monarchy do we engage in such a near-regal spectacle? A brief history of the State of the Union. A look at President Trump’s upcoming State of the Union address on February 5. Congressional website provides facts and background on the State of the Union. The State of the Union Is . . . Perhaps Outdated? A mildly critical reflection on the customary SOTU, occasioned by the Trump-Pelosi tiff.